Contemplating a major remodeling project is part Fantasy Island, part Castle of Doom. On Fantasy Island, anything is possible: a high endkitchen on a low end budget, walls that are magically not load-bearing and thus simple to move, a small bathroom with plenty of room for two sinks. While it’s easy to laugh at those initial assumptions, the first part of planning a project is in many ways the most creative and satisfying. This window seat and garden serves as a transition between the master bedroom and bath. After living with a less than lovely room for years, suddenly you have a chance to imagine what could be. It’s important at this point to think big and come up with as many ideas as you can. Plenty of your initial ideas will prove to be too expensive, or downright impossible because of the limitations of your home or your local building codes. But the value of letting your imagination run wild is that you often uncover the very things that will make your project unique, and bring you the most joy. Thinking about the functions you want the room to fill, rather than its conventional name, is one way to spark your imagination. Instead of kitchen, think room that encourages your teenagers to join the family. That may mean a deep counter with comfortable seating or an adjoining family room, even if there is room only for a sectional and a large tv. If you want your partner to join you in food preparation, think a room with space for two people to work without bumping into each other. If you want to keep an eye on younger children as they do their homework, a banquette and an easy to clean pedestal table with a built-in charging station will fit the bill. Understanding what you really want the space to be results in rooms that fit you, rather than you force-fitting yourself into an unsuitable space. Unfortunately, you can’t live on Fantasy Island, so it’s time to move on to the Castle of Doom. This is where paralysis sets in: no matter the project, you are spending more—sometimes considerably more—than you had planned. Most people’s first reaction to the outflow of cash is: I can’t make a mistake! If they make a mistake, the money will be wasted. The decision process, which was so much fun in the imagination stage, now seems fraught with peril. I have two pieces of advice for the paralyzed: do not make decisions solely on the basis of cost, even when you feel you have opened the financial floodgates. The second is to understand that there are very few mistakes; rather, there are miscalculations that can be fixed. My theory of controlling costs is to spend money on doing the job correctly and paying extra for the things that will please you every day. Stick to the basics for the rest. If you are a serious cook, that may mean spending on a professional range and ventilation fan and saving money on simple, utilitarian lighting fixtures and an inexpensive backsplash. If for you preparing meals is a necessary evil, buy a good-looking stove without the bells and whistles and enjoy a beautiful stone countertop and gorgeous light fixtures. The important thing is that nothing looks cheap, which makes you, and down the road, prospective buyers, question the integrity of the entire project. Many classic designs connote a feeling of quality. 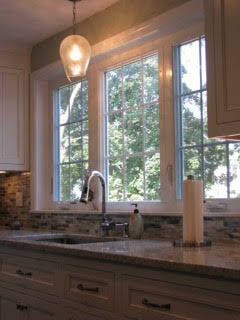 A plain white backslash with subway tiles from Home Depot looks classic, but is inexpensive. Simple light fixtures, a porcelain tile floor, plain but well designed appliances can all contribute to a feeling of permanence and quality. This custom vanity allows for storage without overwhelming the narrow room. Sometimes going with a completely custom piece can be the best solution in a difficult space. When remodeling a very small and narrow bathroom with no storage, I worked with clients to design a custom vanity that allows them to have drawers and cabinets on either side of the sink cabinet. That vanity is now the highlight of the bath. The counter was a splurge of colorful glass shards embedded in quartz, but the sink, faucet, tiles for the floor and the shower stall were all very reasonably priced. The custom vanity elevates the room in terms of style, but it radically adds to its function as well. Whatever choices you make, do your research, measure three times, trust the advice of the professionals you have hired, consult your gut as well as your logic, make your decisions, and don’t look back. Once the space is finished, you can reassess and adjust. Most miscalculations involve aesthetics, rather than function. Your countertops are so busy they take over the room, or you made too many conservative choices, and now everything looks bland. These aren’t disasters, and they are fixable. Take the overbearing counters. You chose that stone because you loved it, but you underestimated its impact. Let’s say it is a strong brownish gray with streaks of rust, which creates a feeling of movement. There are two ways to go: beef up the wall color to a warm paprika, on only one wall or all of them, to visually stand up to the intensity of the counter, or use a more neutral but still strong color like a moody gray with beige undertones that absorbs it. Use a strong pattern on windows and/or seat cushions that includes the paprika but adds a number of other colors, which will make it stand out less. Details like this handmade pendant light bring personality and beauty to a neutral kitchen. Or, go in the opposite direction and make walls and fabrics a soft medium-toned neutral but use copper lighting fixtures or one other decorative element that relates to the counterto allow it to take center stage. This is a strategy professional use all the time: we do our best to fully imagine the space, but even if the plan is completely drawn out before construction, there are always adjustments to be made at the end of the project. Creating a room is a process full of discovery. And though you may have to weather a few storms to get the space you want, focus on the big picture. When that’s right, the details will fall into place, and, if they don’t, they will be easily adjusted. Sometimes the shock of the new takes getting used to. Nothing is wrong—it’s just that your eye needs to adjust to new space, furnishings, and colors. Impossible as it is to believe, a month or two after your project is finished and your house is calm again, you just might miss the intensity and creativity of being immersed in a remodeling project. Luckily, there are always other rooms.